Getting increasingly irritated, he grabs the unmovable Blob's gut and begins pulling, until Blob is forced to uproot himself from the ground, at which point Hulk proceeds to bounce him through the air like a ball. 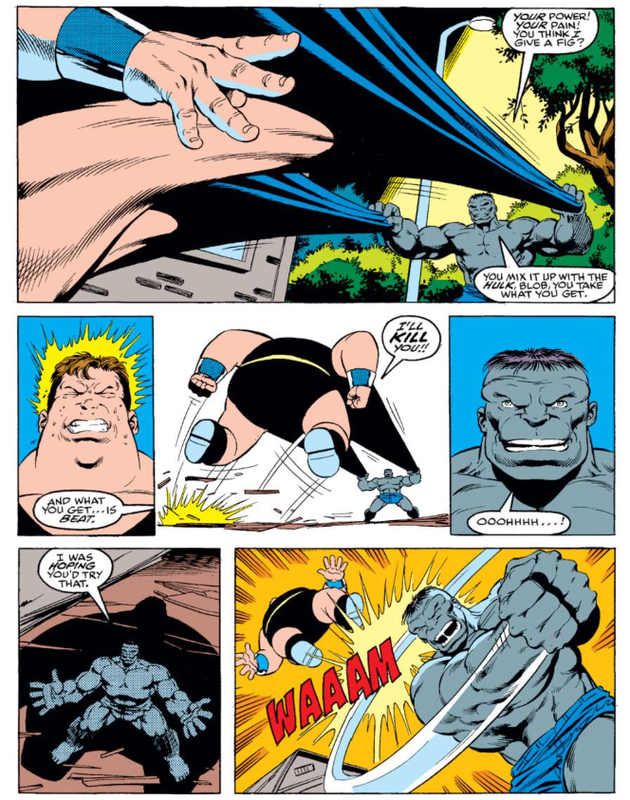 However, Hulk unintentionally knocks Blob into the house of the family that had befriended Banner, destroying the home and trapping Jack in the wreckage. Despite himself, Hulk tries to save the boy, and with Crimson Commando's help, they pull him from the wreckage, still alive. 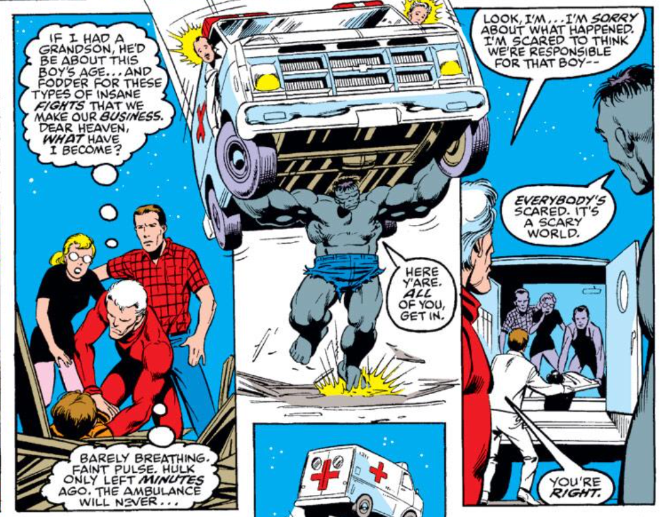 Hulk leaps off to find an ambulance and returns minutes later carrying the vehicle. As the paramedics load Jack inside, Hulk knocks out Crimson Commando then gathers up the ambulance once more, and leaps away. 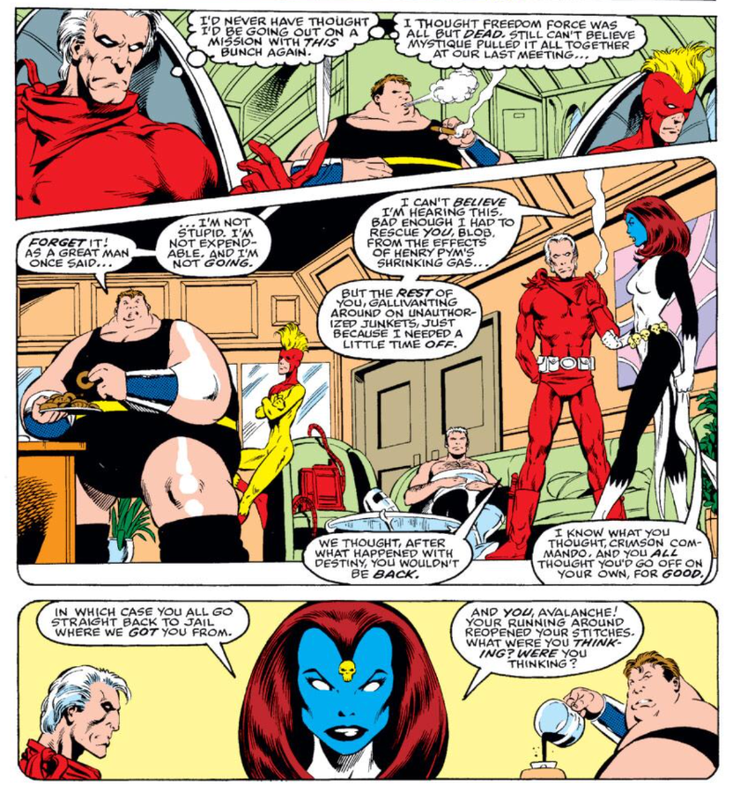 In two pages of this issue, Peter David smooths over some of the chronology tangles that came about from Freedom Force appearing in Avengers #312 so soon after being fairly trounced by the Reavers in X-Men #255, confirming that Blob, Pyro, and Avalanche were operating of their own volition, with Mystique asserting it was stupid of them to think Freedom Force had disbanded just because she needed some time off to deal with Destiny's death, and further revealing that she helped rescue Blob and restore him to normal size after being shrunk by Dr. Pym. We even see Avalanche still recovering from the wounds he received from Lady Deathstrike, with Mystique admonishing him for wrecking his stitches when he went out with Blob and Pyro. 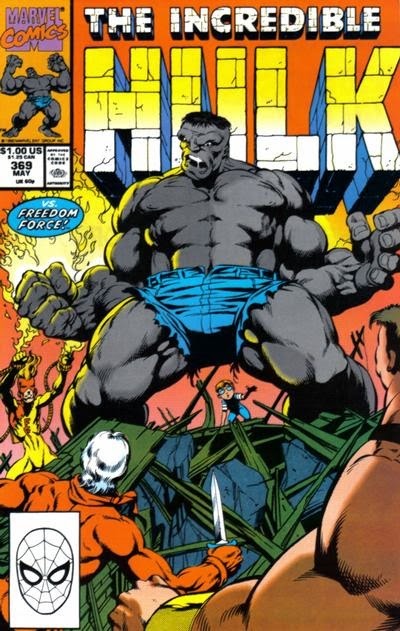 Art in this issue comes from regular Hulk artist Dale Keown (who just became the new series artist as of issue #367), most well-known for his run on on this series and his creator-owned Pitt from Image Comics. I don't believe he's done much of late, which is a shame, since his work in this issue, at least, is really strong, and I'd love to see more of it. He's inked by New Mutants co-creator Bob McLeod. A subplot page in this issue features a mysterious figure named Prometheus searching for Hulk; I believe this is setup for Hulk's eventual involvement with the group called Pantheon. Freedom Force's appearance here comes after Avengers #312 and before New Mutants #88 & #89. Blob notes that even Daredevil defeated Freedom Force recently, a reference to Daredevil #269. Mystique is still mourning Destiny's death, finding it difficult to interact with an older woman who believed she'd spotted the Hulk. Hulk takes advantage of Blob's ability to not be moved by basically grabbing his belly and stretching him out until Blob is forced to move, which is pretty funny. Crimson Commando deals with something of a crisis of conscience throughout this issue, despairing over the fact that all he's done with his life is fight, and wondering if Freedom Force is even doing any good. 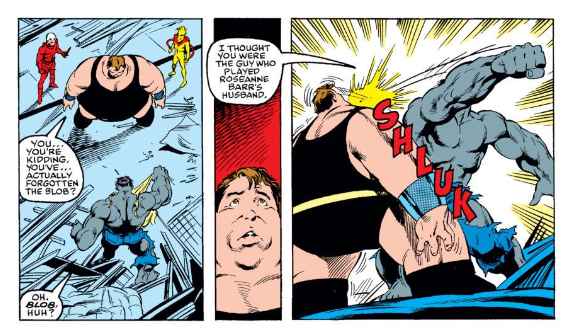 Hulk compares Blob to John Goodman, the actor who played Roseanne Barr's husband on Roseanne. This issue is actually a lot of fun. 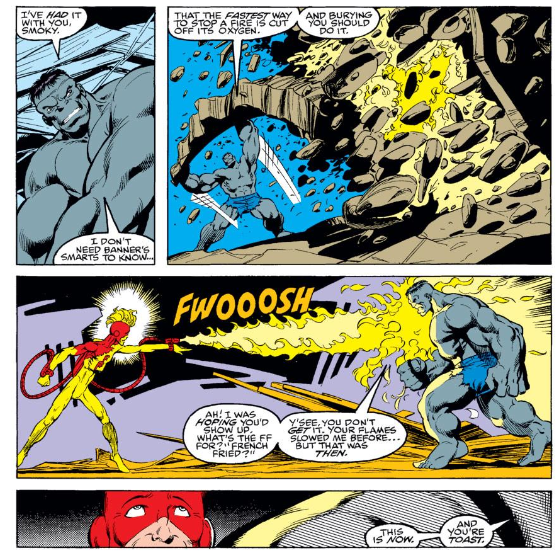 In addition to being a welcome continuity patch, smoothing over Freedom Force's "Acts of Vengeance" appearance relative to their battle with the Reavers, and a nice companion piece to Daredevil #269, in which Blob and Pyro faced off against a different non-X-Men foe, it also works as an effective done-in-one issue. Whatever is happening in Hulk's book prior to and after this issue is irrelevant, and while knowing the recent goings-on with Freedom Force adds to the story, not knowing wouldn't take anything away from it, and still offers some characterization for the villains. Crimson Commando even gets a nice little character arc, realizing that for as many years as he's lived, all he's done is fight a lot, which adds a melancholy touch to the character I wouldn't have minded seeing touched on elsewhere. And, of course, there's also something fun in seeing the Hulk face off against someone he can just wail on mercilessly, and the Blob/Hulk fight doesn't disappoint, taking full advantage of Blob's "unmovable" power for great comic effect. Dale Keown is an artist whose work I'm not terribly familiar with, but I really like it here. It has the feel of animation grounded in reality: both Hulk and Blob are larger than life, but not grotesquely so, and even the more mundane characters are drawn interestingly (I like the oversized glasses on the little kid). It's almost Alan Davis-esque, and helps elevate an already-enjoyable story. Tomorrow, more of the same in Excalibur #22 and Friday, the long wait for Larry Hama begins in Wolverine #24. Next week, Morlock fun in Uncanny X-Men #262. I loved the bit about how you really shouldn't tell Hulk to "go get an ambulance". "Blob notes that even Daredevil defeated Freedom Force recently, a reference to Daredevil #269." Outside of CC and that one annual where they defeated the Avengers, FF really were just jobbers for whatever writer needed a group of...jobbers. Given how incompetent their overall record was, one has to wonder why the government kept them around at all. Of course, it doesn't help that their most powerful member, Spiral, isn't around (of course, that never stopped Simonson). I had no idea Keown started this early on the title...but I guess by 1990, it wasn't so early, given that he will be among the second wave of Marvel artists who defects to image. For the most part, he is a good artist, but his kids look horrible. His early artwork here has a real Alan Davis feel to it, especially with Mcleod's inking. @Teemu: I loved the bit about how you really shouldn't tell Hulk to "go get an ambulance". @wwk5d: Given how incompetent their overall record was, one has to wonder why the government kept them around at all. PR purposes, maybe? Like, "we are dealing with the mutant problem, we have Freedom Force"? Results being irrelevant. His early artwork here has a real Alan Davis feel to it, especially with Mcleod's inking. I was really struck by that. Most of my limited experience with his work comes from his stint on Top Cow's THE DARKNESS, and I don't remember his stuff looking much like this (which I really quite like). My favorite bit was the first part of the Hulk/Blob "fight". Blob, initially reluctant about facing the Hulk, finds his courage and starts to become overconfident. "I can't be moved! ", Blob boasts. "Bull! Not even my best shot?!" "Good. Don't move. Adios, moron!" Hulk says as he leaps away. And that's when Blob realized he failed in his mission to stop the Hulk. The ineffectualiness only comes from having to guest-star on other books with the writers really yealous about their title carriers, and may in fact carry an anti-governmental message, because on their own and without the "superpowered federal agents" strappings they have been a good show. It's their conditional pardon that done the ill, just think how the X-Men would fare if it was them who're officially sanctioned and told that they can't anymore wreck all the places they go. Bob McLeod continued to ink Keown up to 377. That Hulk run, from 368-377, is my favorite run of Hulks ever. Keown was PAD's best Hulk collaborator ... he lasted a while too, from 367 to 397 (albeit with lots of fill-ins). Any Keown/McLeod or Keown/Farmer issue looked absolutely gorgeous, and Keown's storytelling was impeccable. Just after Keown's departure, PAD and Keown won an Eisner Award for Best Writer/Artist or Best Writer/Artist team, beating out Dave Sim and Gerhard for"Cerebus," as well as Frank Miller for "Sin City" and the Hernandez Bros for "Love and Rockets." Long story short ... David/Keown Hulk is EPIC WIN. Teeb, dunno if you plan to -- when the time comes -- look at Incredible 391/392, with its X-Factor crossover ... but I hope you do, if only as it would let you see the totally sweet Keown/Farmer art. Ha, yes. At my locality we were denied quite a lot of stuff up for to be X-amined in forthcoming future, but they did give us the greener meaner bit of David/Keown HULK. Goddamn if PAD's obsession for Twin Peaks wasn't annoying! Let the damnation rain down upon me, for I was never annoyed by it. 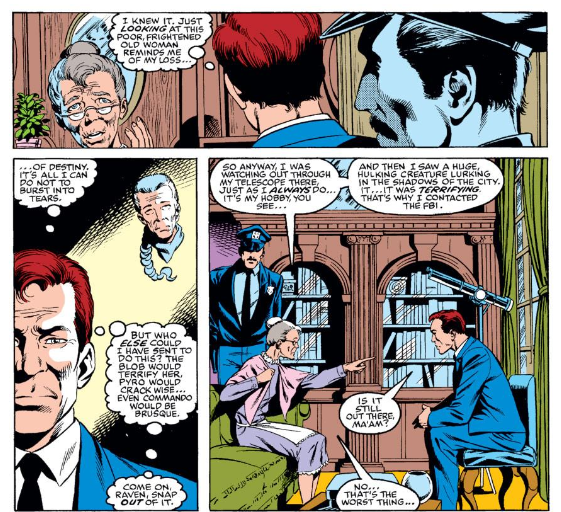 Uuh I was, but lately I have combated it with head-canon where Valerie Cooper's brother, the one in FBI, always boasting with his interesting cases, was corrupted by BOB, like everything in Marvel Universe generally gets corrupted by Bob, and he's currently operating in MCU under the assumed name of Cal. If I were to start a blog (I'm not) I would do an issue by issue analysis of PAD's Hulk run. It was the run that made me a comic book fan. Dale Keown was one of my favorite artists in the early '90s, and his Hulk art holds up even today. Unlike other Image guys, he had storytelling chops to go with his pin-up shots. I liked how he drew facial expressions as well as fight scenes. After reading the Dark Phoenix Saga I realized there was a strong Byrne influence on his work. Unfortunately, Keown's art one of calcified after awhile. I read Pitt for awhile and saw his figures stiffen and become seriously over rendered. I think drawing veiny, muscled monsters and scowling sci-fi aliens overwhelmed his other skills. Also, I think his irregular schedule didn't help. His later returns to the Hulk (Hulk/Pitt, Hulk: The End, and Darkness/Hulk) don't look as good as the Keown/ McCloud or Farmer material. Anyway, references & puns are part of the Peter David Experience. You either go with them or you don't. For my part, he was my first favorite comic book writer and I still enjoy his work in both comics and novels. @A. Painter: And that's when Blob realized he failed in his mission to stop the Hulk. I dug that bit too. Great stuff. I dunno; technically, they failed in their attempt to kill Kelly, Rogue took down the Avengers more than they did, the battle with the X-Men while Mystique went after work was about internal business and not really furthering their cause, and they only captured Magneto cuz he gave himself up. And yeah, they drove off the Reavers, but only after two of them were killed and another seriously wounded. Yeah, it's a pretty direct crossover (part 1 there, part 2 in XF, or whatever) so I'm planning on covering all of it. Cool. My prediction: You will dig them.